For a full Eric Rohmer filmography, click here. AF: How did the idea of The Lady and the Duke come to you? ER: While on holiday about ten years ago, I came across a digest of the memoirs of Grace Elliott in a history magazine. This English lady had been the mistress of the Duke of Orleans, King Louis XVI’s cousin, and had written an account of her life during the French Revolution. The article mentioned that her town house was still standing at such-and-such a number on Rue Miromesnil. I have always been interested in places and was particularly struck by the idea that this house could still be seen at a certain address. That gave me the idea of making a film that would be set in that particular spot in Paris and would play on the relationship between the peaceful apartment, which served Grace as a kind of hideout, and the rest of the city in the throes of revolutionary turmoil. Strangely enough, I found out later that the article in the history magazine was wrong: the house on Rue Miromesnil had been built after the Revolution, so Grace Elliott couldn’t have lived there! But without that mistake, I’m not sure the article would have sparked off the idea in me. AF: The portrayal of Paris was the driving force behind the film . ER: Yes, and I had to find a way of depicting historical Paris. I’m often frustrated when I watch period pieces set in Paris. People always tend to go off and film in Le Mans, Uzès or other towns with well-preserved historic neighbourhoods. I can always tell it’s not Paris, which has its own specific architecture. I didn’t want that, nor did I want to make do with filming the same handful of old carriage doorways that always feature in period films. I wanted to show a big city with big open spaces like Place Louis XIV (now Place de la Concorde), which was a focal point of the Revolution, and the parts of town that Grace Elliott mentions in her memoir: Boulevard Saint-Martin, Rue Saint-Honoré, down which she is taken on her way to the Surveillance Committee, and so on. When she says she walked all the way to Meudon via the Invalides, she had to cross the Seine somewhere! AF: So what was the solution you came up with? ER: I had shot two period films before: The Marquise of O (1975) in real locations and Perceval le Gallois (1978) entirely in the studio. I knew that neither of these methods would give an authentic portrayal of Paris. So I had the idea of inserting real-life characters into scenic backgrounds that I would have specially painted, based on the layout of the city at that time. Inserting characters into sets is one of the oldest tricks in the filmmaker’s book. Méliès was probably the first to do it. But ten years ago, when I first started thinking about the project, digital technology was still in its infancy. 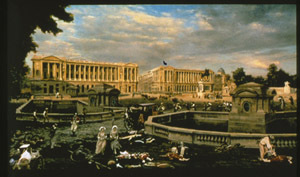 If the characters and scenery had been composited on film, each new layer would have incurred a loss of picture quality. Kinescoping, i.e. transferring from video to 35mm film, wasn’t very satisfactory either in those days. Now both of these techniques have been perfected. ER: They were painted by Jean-Baptiste Marot. We designed them together in the appropriate period style and according to the requirements of the mise en scène. Hervé Grandsart did the preliminary documentary research. We worked from pictures and engravings, but also from street maps of the period. The interiors are not real locations. They were all built in an adjoining studio by the set designer, Antoine Fontaine, and the rigger, Jérôme Pouvaret. To me, this work was not just a matter of being meticulous it was about striving for an authenticity that underpins the whole film. At heart, I wasn’t especially intent on making a film about the Revolution. I don’t much like being pegged as an 18th century buff! Even though I’ve sometimes been compared to Marivaux, it isn’t my favourite century. ER: Yes. I don’t much care for photographic reality. In this film, I depict the Revolution as people would have seen it at the time. And I try to make the characters more like the reality you find in paintings. The opening scenes of the film are pictures, and I’d be pleased if the uninformed spectator thought they were period paintings and was surprised when they suddenly come to life. AF: One is also reminded of your work in educational television. ER: I didn’t make this film for any political reasons. I don’t use it to defend any party, royalist or anti-royalist. On the other hand, I would like to help cultivate a taste for history in audiences, both old and young. I have heard it said that France is the country that publishes the largest number of history magazines, whereas the English-speaking world has more taste for historical novels. There is a huge potential interest in history in France, but period films have often been rather lax about historical exactitude. In fact, my scrupulousness is the reason why I have only made three period films. I pay close attention to the language of a period and it’s very difficult to write dialogue in the words of a different era. It keeps the characters from expressing themselves. If I used my own style to write a story in the past, it would be a pastiche. It wouldn’t be any good. Here, Grace Elliott’s story gave me a very sound basis, right down to the dialogue. AF: Did you watch other historical films again before starting on The Lady and the Duke? ER: I watched three period pictures: D.W. Griffith’s Orphans of the Storm (1921) (which is set during the French Revolution), Abel Gance’s Napoléon (1927) and Jean Renoir’s La Marseillaise (1937). All three films are admirable for different reasons. For example, for a long time Renoir was praised for making his characters speak as they did in the 1930s and not bothering about 18th-century speech. That’s a myth, unless we believe that the language of the 1930s was closer to the 18th century than our own! Griffith made me realize something else: I was wondering how to film the exteriors, i.e. how to insert the characters into the scenery. Would I film sequence shots or reverse angle shots, which would make the process even more complicated to set up? Seeing Orphans of the Storm again, I realized that most of the time, its strength is that each shot is static. So I took static shots, and closer shots with a second camera. AF: Were you always sure that the characters could be keyed in as you wanted? ER: We ran tests. We had to know how the characters would fit into the scenery, so we filmed a test with extras going through a doorway and it worked. We sometimes had to adapt a little, especially when the set was deeper than the length of the studio. For instance, the view down Rue Saint-Honoré had to be 200 metres long, while the sound stage was only 40 metres wide. We had to shoot that sequence in several parts with cutaway shots in between. It was a constraint, of course. I normally decide how to shoot each scene as I come to it, whereas here I had to design the shots very precisely beforehand. But the advantage is that the result is truer than if I had edited it all together from little bits of houses and roofs framed from odd angles to cut out the TV aerials. That wouldn’t have interested me. I like to show the scenery as it is. On the set, I often hear people say “We’ll cheat it.” I don’t like cheating. I like to take reality the way it is, even if it’s a reality I created through painting, like here. Truth comes from the painting, not the editing. You could say I’m faithful to Bazin’s teachings, even if he was too hidebound regarding depth of field and the sequence shot. And I do think that resorting to a highly visible artifice gives me truth. AF: To return to the story itself, what appealed to you in Grace Elliott’s memoirs? ER: My researcher found me a complete copy of the text, which had been published several times in France. Grace Elliott was born in 1760 and died in 1823. Her journal begins on 14th July 1789 and ends just before she was let out of prison, after the fall of Robespierre. Over and above its undeniable historical interest (it contains a few minor errors in dates, but most of it has the ring of truth), there is something striking about it, as though it had already been written as a script, with scenes, sequences and even dialogue. It has a very different tone from the other journals I have read. Memoir-writers mostly tend to write about themselves, their fears and hopes, but Grace Elliott includes herself in the picture, though always maintaining a certain detachment and distance. We see her acting and moving around, but the other characters also live in a very powerful way, especially the Duke of Orleans, of whom we have very few first-hand reports. AF: Was it her loyalty to her commitments that touched you? ER: No, it was more her British stiff upper lip: a certain modesty and self-control, a completely unaffected way of talking about herself and, above all, a way of looking at events that makes her the heroine of a novel. Perhaps this is how it happens when History overturns the lives of individuals. Few other historical characters have ever seemed so close to us, and so moving. I can only talk about my intentions, not about the result, but the details of her private life that appear in the book, which I kept in the film, create an effect of reality. For example, I’m thinking about the moment when Orleans looks at his watch. We’re in the present, in the moment. That’s what makes it filmic. The past is the tense of the novel; the present is the tense of cinema. AF: You were also interested in the light the characters shed on the events of the Revolution. ER: What interests me is their lack of fanaticism. Grace stands up for the King but she is not an extremist. She doesn’t want to leave France. She has Republican friends such as Orleans and Biron. She is probably actually less of a royalist than she says, given that she wrote her book in anti-Revolutionary England. As for Orleans, he is often shown in a totally negative light, but there is a mystery, an ambiguity, a duality about him that interests me. He was vindictive and he didn’t like Louis XVI, but he was also sincerely attracted to new ideas. I have added some details drawn from his own correspondence and the testimony of his son, Louis-Philippe. AF: The audience might be inclined to condemn the killing of the King, as Grace does. ER: I think that at the time, everyone wanted the King dead for fear of appearing reactionary. It was the trend then, rather as it is the trend nowadays to claim to be an environmentalist. I wanted to make my film with Grace Elliott’s story, not against it. If anyone wants to pass judgment on historical grounds, they should judge the book on which the film was based, not the film itself. AF: How did you choose the actors? ER: By intuition, as always. I audition one person, he or she reads the lines, and that’s it! I had difficulty casting the Englishwoman. A casting director known to Margaret Menegoz sent me photos of actresses and an audio tape of their voices. The only tape I liked was of an actress who said she knew Grace Elliott’s book and wanted to play her. Her voice appealed to me before her photo did, and when I met her, I found the actress even more attractive than her picture! As for Jean-Claude Dreyfus, I didn’t think of him at first, but I was looking for a strong personality. I needed somebody big and stout, even if he didn’t physically resemble the Duke of Orleans all that closely. I am very pleased with the cast. My directing of actors, as usual, went no further than giving them technical instructions. Feelings are the actor’s business. All I did was tell them to enunciate clearly so that they would be understood. They didn’t let me down. AF: Do you think the film will surprise audiences used to your Comedies and Proverbs and Tales of Four Seasons? ER: No, and besides, whenever I have made slightly different films, be they historical or political, like The Tree, the Mayor and the Media Centre (1992), the audience has followed. I wouldn’t want to limit myself to overly psychological topics or romantic comedies, even if that’s where I feel most personally involved. I like to get out from time to time. Eric Rohmer – Professor of French Literature. Critic for the Revue du cinéma, Les Temps modernes, La Parisienne, Arts. Editor-in-chief: La Gazette du cinéma, Les Cahiers du cinéma. Author: Hitchcock, with Claude Chabrol. Les Contemplations, Hugo architecte, Louis Lumière.